You’ve heard the expression, to be at loose ends. 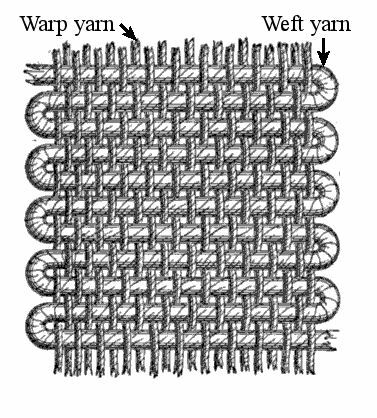 I’m probably making this up but let’s suppose the true origin of the expression is from weavers as they reached the end of the warp yarns. They would find themselves at loose ends. Weaving creates a powerful word picture for that idiom because it is makes sense that there’s a call for action on the part of the weaver. He will need to bind the end of the fabric to finish it off, so that the loose ends are not able to fray. When I look at the tapestry of my life, it feels like there are many loose ends. I’m casting about trying to understand the relationship of one yarn to another. Some strands are coming to an end while others are vibrant and powerfully influencing the direction of my life. Yet a tapestry is not created around a single thread or yarn by itself. It requires the presence and purpose of all of the other yarns with it. I keep staring at the short yarns that seem to have ended too soon, and others that seem unwieldy and never-ending. Some threads I need and others I’m ready to toss out like a bad date. Through it all there is the conundrum of the now and the not yet. Have you ever felt the tension between letting go of one thing and trying so hard to be into the next thing, and it remains elusive to you? I know I’ve quoted this bit before, but Elizabeth Elliot speaks of the need to “… carry within one’s self the unanswered question.” That is so apt for this present season of my life. To carry within seems to denote a yieldedness to be burdened. There is also a letting go of expectation. No more insistence, “It has to go my way, or I won’t play.” As elementary as that sounds, it is most often where I find myself. Thankfully yielding doesn’t entail blindly thrusting ourselves into a black hole. We entrust ourselves to the King. Remember earlier I mentioned that the weaver needs to bind the loose ends of a tapestry? In a way I picture myself binding myself, my loose ends and my life to my King. Somehow I’m going to choose to let Him lead, and yield myself to that vulnerable and soul-searching process. This entry was posted in Musings and tagged contentment, Elizabeth Elliot, Hope, Life, tapestry, transparency, trust, warp, weave, yieldedness. In my last blog entry I talked about Being You…for such a time as this. For the last year or two, I’ve been observing friends and family members who, just like me, are in transition from one season to another. It seems like so many of us are on the brink of the next thing, as we wait with breathless wonder on how things will work out. Where will we be in our careers? Will we get that promotion? Do we even want careers? What will our ministry look like this time next year? Will we be in Africa? In Nebraska or North Carolina? Married? Enrolled in a graduate program? So many questions and not enough answers. As I continued to ponder Esther’s life, it seems like her story is more significant to me than I realized. Entertain a corollary, if you will. Each of us has questions about what the future holds, and certainly the economy and ideological changes in our country encourage that sense of uncertainty, or at least confirm it. No longer can you assume identity with a company to the extent that you *know* you’ll be with them for 30 years, and then retire. Even more challenging is when life throws a curveball and you find yourself struggling to put food on the table. I’ve been there. Suddenly, the focus shifts from the future to making it through the day, and the goals become more short-term, like paying rent this month, or avoiding shut-off notices. The reason Esther found herself in the king’s palace to begin with was because the king was seeking a woman who would set a godly example for women throughout the Persian empire. Esther’s beauty surely played a part … natch, the king wanted a beautiful chick. But it was Esther’s character that caused her to find favor in the eyes of all who saw her. The thing is, Esther stepped into the position of queen long before she was ever acknowledged and crowned. She had one requisite visit with the king, as a part of the campaign, but “she would not again go into the king unless the king delighted in her and she was summoned by name … So Esther was taken to King Ahasuerus to his royal palace in the tenth month… The king loved Esther more than all the women, and she found favor and kindness with him more than all the virgins, so that he set the royal crown on her head and made her queen instead of Vashti.” Esther 2:14-17 pp. Esther spent four years in the king’s palace before something happened. Do your homework, prepare yourself. But when the time is right, take your position and simply stand. This entry was posted in Musings and tagged authority, confidence, Destiny, future, purpose, trust.